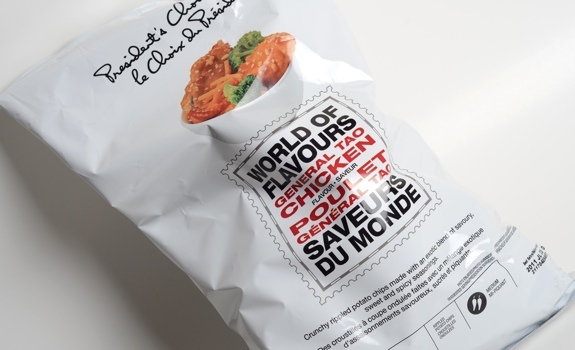 General Tao Chicken potato chips from President's Choice, a curious chip flavour from a line of curious chip flavours. Take potato chips and combine them with General Tao chicken, a staple of North American Chinese food, and what do you get? An OK chip that doesn’t quite hit the mark. Part of the President’s Choice World of Flavours line of potato chips, these General Tao chips are rated medium on the spicy scale, and, in my estimation, about the same on the yummy scale. Buried under what tastes like all-dressed chip flavouring, there’s some of the telltale General Tao sweet-and-spicy mix – some soy, some ginger, some garlic, and a whole lot of sweetness. 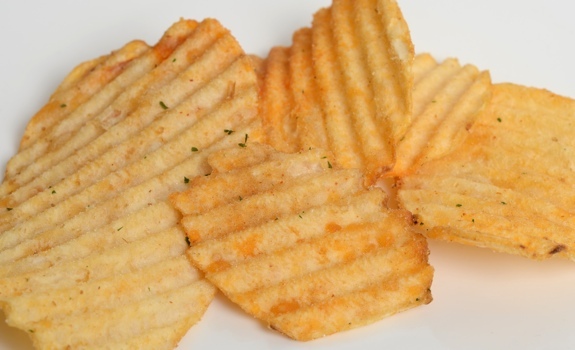 The thick-cut rippled chips don’t lack seasoning, which has been amply applied. But the main flavours that leap out are salt and chili peppers, which reach from the background and steal the show. By the 15th chip, my mouth started to tingle, partly from the chili and partly from all the salt. Do they taste like General Tao chicken? Sort of, yes. But they’re not a dead-ringer. Note the thick, deep ripples and ample flavour coating on these General Tao Chicken potato chips. Cost: $1.66 for a 235-gram bag at Superstore. Value for cash money: Fan-freaking-tastic. Can’t argue with the price. Nutrition? : Per 50 grams: 280 calories, 16 grams of fat, 340 mg of sodium. Not great, in other words. MSG! : Yes, according to the ingredients panel, there’s monosodium glutamate in these here chips. The verdict: Not bad. The flavour doesn’t quite live up to expectations, but they’re still pretty decent. If anything, it’s a conversation starter on the snack table.